History shows that returns on equities are made up primarily of reinvested dividend income. The 'case for dividends' has also been made in numerous academic and financial research articles. According to the Barclays' 2011 Equity Gilt Study, £100 invested in equities at the end of 1899 would be worth just £180 in real terms today (i.e. allowing for inflation)without the reinvestment of dividend income; however, with reinvestment, the same portfolio would have grown to £24,133. The chart (reproduced by US blogger Portfolioist, quoting Simple Stock Investing) shows quite starkly the impact of dividends on total stock market returns for the US S&P 500 the difference, adjusted for inflation, between what an S&P 500 investor would have earned over the past 60 years if they reinvested every dividend (the orange line) versus what price appreciation alone brought in. It is a log chart - so look carefully at the scale on the left hand side of the chart. As can be seen, reinvesting all dividends produced about 8 times the return. According to Standard & Poor's (as quoted by the Portfolioist), the dividend component was responsible for 44% of the total return of the last 80 years of the index. This is all the more remarkable give that the dividend yield of the S&P 500 has been dropping over time. If that doesn't impress you - have a look at the chart (below) from an iShares / BlackRock article on dividend-paying stocks in October 2010 There is a chart showing that the average dividend-paying stock in the S&P500 has massively out-performed the average S&P 500 stock, going back to the early 1970s. It is also striking that this out-performance is a long-term phenomenon. 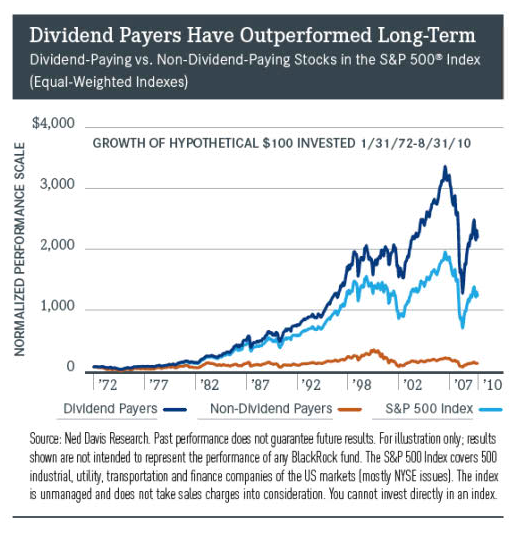 In the words of BlackRock "Dividend payers offer income that rivals Treasury yields, but come with growth potential not typically available in the bond market. In addition, because of the discipline imposed by a dividend, these stocks tend to be higher quality and less volatile than the broader equity market..."